Original Signed Hardcover Edition: Produced for the 1995 Conference, Limited Edition. A bound collection of 29 papers by Doug Engelbart and his staff from 1960 to 1992, plus a short biographical sketch. Chronicles the progression and unfolding of Engelbart's work, including his seminal 1962 report outlining his original vision and approach, and detailed depictions of the innovative breakthroughs in interactive technology, in harnessing collective intellect to solve important problems, and in strategic organizing principles for the accelerative continuous innovation of how we do this. See Doug's Bibliography for a complete listing of articles included (#2-29), most of which are available online. This item is currently out of print. 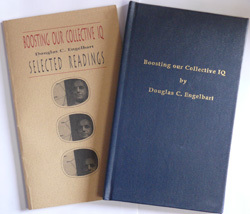 Titled Boosting Collective IQ: A Design for Dramatic Improvements in Productivity, Effectiveness and Competitiveness, this companion to Doug's half-day Management Seminars includes printed slide handouts and selected readings. For background on the seminar see the 1995 Bootstrap Seminar site for companion binder, program, video, and more. See the Engelbart Academy for more background and video selections. Titled Bootstrap Seminar: A Comprehensive Strategy For Bootstrapping Organizations into the 21st Century, this companion to Doug's comprehensive 3-day Management Seminars presented at Stanford University, includes complete printed slide handouts and selected readings. See the Bootstrap Seminar site for details including seminar program, video, binder contents, and more. See the Engelbart Academy for more additional video selections. Books including articles authored by Doug Engelbart. For further details on these articles, see Doug's Bibliography. Edited by Noah Wardrip-Fruin and Nick Montfort, The MIT Press, 2003. Doug Engelbart appears on pages 5, 29, 35, 93-108, 231-246, 290. 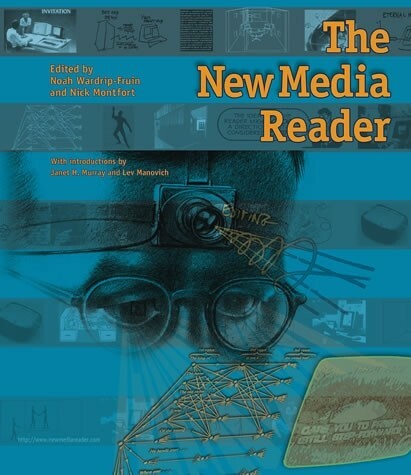 See especially the excerpted Inventing the Medium: Introduction, by Janet H. Murray. • Augmenting Human Intellect: A Conceptual Framework. 1962. Irene Greif [Ed. ], Morgan Kaufmann Publishers, Inc., San Mateo, CA, 1988, pp. 35-126. • A Conceptual Framework for the Augmentation of Man's Intellect. 1963. • A Research Center for Augmenting Human Intellect. 1968. • Toward High-Performance Knowledge Workers. 1982. A History of Personal Workstations. • Intellectual Implications of Multi-Access Computer Networks. 1970. Books featuring Doug Engelbart in one or more chapters. A Heritage of Innovation: SRI's First Half Century. John Markoff. Penguin Books, 2005. Bootstrapping - en strategi för att förbättra förmågan till bättre förmåga : kunskapshantering i en komplex och tidspressad verklighet. Portraits of Success: Impressions of Silicon Valley Pioneers.